Home : Ignite: Learn. Move. Create. 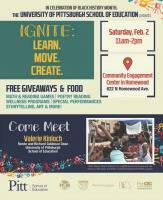 Join the School of Education and its partners in celebrating Black History Month at the Community Engagement Center in Homewood. Community members are invited to stop by any time for fun-filled workshops on math, reading, poetry, wellness, storytelling, art ... and more! There will be free giveaways and food for all in attendance.